I spent the weekend in Moab, Utah. 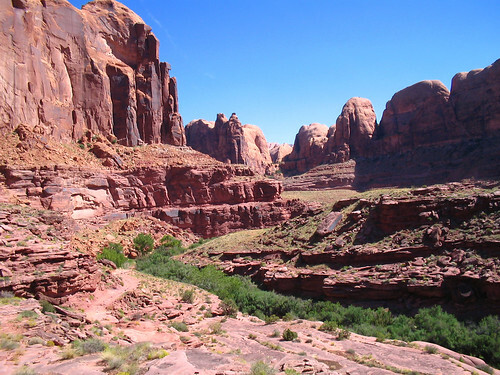 Having lived in Utah all my life and with Moab being four hours away by car, you would have thought that in twenty eight years I would have managed to get down there before now. Moab is a small town with a lot of energy and life. The occasion for the visit was a semi-annual mountain biking trip with my co-workers. The talent of our group's bikers varies greatly from guys who are willing to try all sorts of crazy stuff to people like me who are just grateful to be able to hike the bike along the trail at times. We started out on Friday morning leaving Salt Lake City at 6:30 AM, by noon we were on our first bike trail in Moab. It was pretty hot outside, but I figured everything would be great because I did have 2 liters of water in my Camel Back. The trail was really picturesque and fun. There were lots of interesting obstacles, some that I could ride, others that I couldn't. Regardless of the ride ability it was a blast to be on the trail. Unfortunately for me, on the way back down the trail I started to feel really sick. As it turns out, I managed to get myself a pretty good case of heat exhaustion. I spent most of Friday evening in the Moab hospital with an IV dripping fluid into my body. As things turned out, I wasn't the only person to get injured that day. A co-worker managed to fall on his elbow resulting in a fracture. 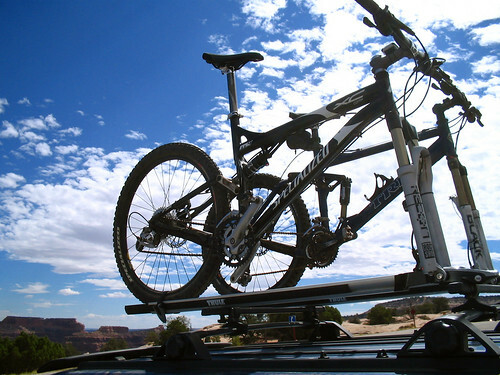 Because the two of us had been banned from biking for the rest of the weekend, while the rest of our team enjoyed trails such as Slick Rock and Porcupine we decided to take a four-wheel drive vehicle through part of Canyon Lands. Though it was somewhat disappointing to miss out on the rest of the weekend rides, I was still able to have a good time with the team. 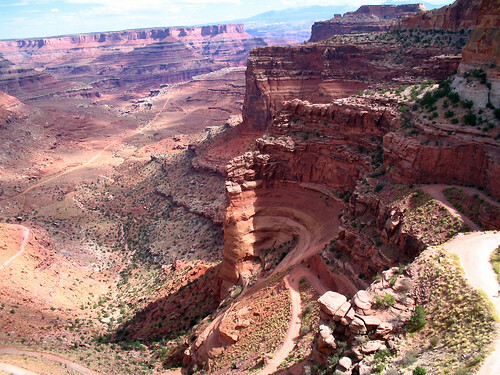 There really is a lot to see and do in that part of Utah that doesn't require a bicycle. Even when seen from the window of a vehicle, the geography is just stunning. It's now clear to me why people will travel such great distances to bike, hike, and ride in these areas of Southern Utah. I'm excited for the Spring trip. I'll be more careful about the heat/hydration situation, and maybe I'll get to bike on three days instead of one. It was fun to get out of town for a weekend.